Jeté Laurence as Ellie in PET SEMATARY,. ©Paramount Pictures. CR: Kerry Hayes. 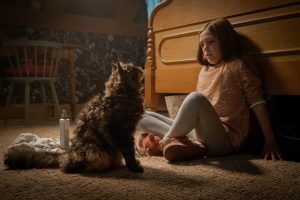 As directors Kevin Kölsch and Dennis Widmyer’s (“Scream: The TV Series”) big-screen remake of Stephen King’s classic novel “Pet Sematary” reminds audiences: “Sometimes dead is better”—and sometimes things are better left alone. Not that the new Paramount Pictures release is terrible—it’s just not as terrifying as its 1989 predecessor, also produced by that studio. While one could argue that’s because the story has become a bit too familiar over the years, anyone who has seen the movie’s trailers know that writers Matt Greenberg (“Halloween H20: 20 Years Later”) and Jeff Buhler (“The Prodigy”) took some liberties with King’s source material and changed things up a bit. While Greenberg and Buhler do a commendable job of making the story fresh while still capturing the novel’s original spirit, like the bodies buried in “Pet Sematary’s” mysterious Micmac burial grounds, for some reason this adaptation just isn’t quite as lovable. For the most part, the plot remains the same: big-city family the Creeds (this time from Boston instead of Chicago) move to rural Maine, only to discover that their new home has a creepy pet cemetery (misspelled “sematary”) in the backyard. When their cat, Church, is run over by a truck, the family’s neighbor, Jud (played by John Lithgow, “3rd Rock from the Sun”), instructs the Creeds’ patriarch, Louis (Jason Clarke, “Terminator Genisys”), to bury the cat deep in the woods, past a protective barrier that borders the pet cemetery. The next morning, Louis and his wife Rachel (Amy Seimetz, “Stranger Things”) tell their young daughter Ellie (Jeté Laurence, “Younger”) that Church has run away, only for Ellie to inform them that he came back last night and is sitting in her closet, looking a little worse for the wear. Of course, Church’s rough appearance isn’t the only thing that’s changed about the cat. When Church threatens Louis and Rachel’s son, Gage (played by newcomers Hugo and Lucas Lavoie), Louis tries to euthanize him but can’t. Instead, he takes Church on a car ride and abandons him in the countryside. Church eventually finds his way back home, and Ellie runs out into the street to get him. Gage wanders into the street, too, to follow his sister, just as a truck speeds past the house. This is where the 2019 version of “Pet Sematary” deviates the most from its source material, as Louis runs into the street and saves Gage—who dies in the book and original movie—while the truck swerves to miss the young boy, causing a large tank attached to it to break loose. The tank ends up striking Ellie, killing her instead. Overcome with grief, Louis ignores Jud’s warnings not to bury his daughter in the pet cemetery and digs up her body after she’s initially laid to rest. He reburies her beyond the pet cemetery’s protected grounds in order to bring her back to life, but just like Church, Ellie isn’t quite the same once she’s resurrected. Laurence delivers a strong performance as both Louis and Rachel’s adorable daughter and as something sinister from the great beyond, and Lithgow is, as always, great in the role made famous by Fred Gwynne (“My Cousin Vinny”). The main problem with this “Pet Sematary” is that most of the genuine scares and surprises have already been given away in the film’s trailers. Coupled with the fact most people are already familiar with the story’s basic premise, the movie is void of any real suspense, which is the very foundation of a great horror film. The few creepy moments the film does have don’t even involve the pet cemetery storyline, but instead the flashbacks Rachel has to when she was a kid growing up with her sick sister, Zelda (Alyssa Levine, “Un monde à part”), who died as a teenager from spinal meningitis. These flashbacks never really pay off in the context of the film, however, and despite being a part of King’s original story, just seem added in for cheap scares since it takes so long for the film to build up to what should have been a terrifying third act. During a press screening for the movie, some audience members were actually laughing during one scene toward the end of the 101-minute film, which was supposed to be chilling and not at all funny. 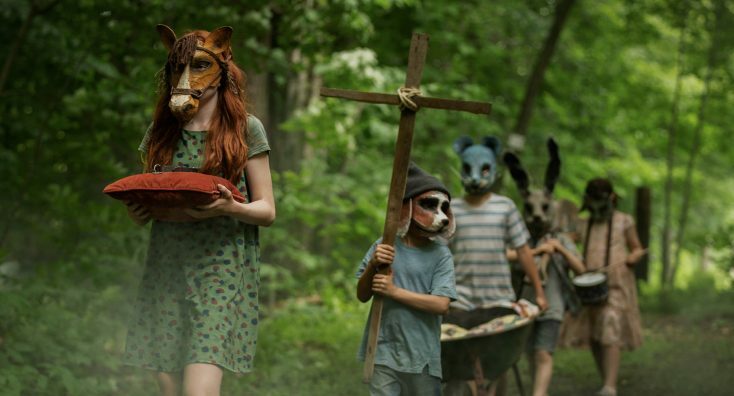 While this “Pet Sematary” is far from the masterpiece one of Stephen King’s other recent retellings, “It,” turned out to be, that doesn’t mean it’s horrible. The ending, in particular, is intriguing, although it also leaves viewers with a lot of unanswered questions. One wonders if the filmmakers are planning a sequel and just what direction the franchise will take. Sadly, audiences will leave the theater more curious about what’s to come—if anything—than haunted by what they just watched, which is a shame since this revitalized version of “Pet Sematary” had so much potential to be something great.